The chain of flowers between Rinka, Miyuki and Satsuki become connected as secrets become revealed. Rinka (Nao Matsushita) lost her parents 13 years ago in an accident. Since then, she has lived with her grandmother. Her grandmother is then diagnosed with stomach cancer and becomes hospitalized. Making things worse for Rinka, the English institute where she works goes bankrupt. Paying for her grandmother's surgery seems nearly impossible. Rinka then thinks of K. K sends a bouquet of flowers every year. Rinka thinks if she can find K, that person might help her. But who is K? Rinka asks her grandmother about K, but her grandmother doesn't say anything. Rinka then sends a letter to K and, later, a man who identifies himself as K's secretary appears in front of her. Rinka tries to find out K's identity and why he keeps sending flowers. Miyuki (Miki Nakatani) married Kazuya 3 years ago. Kazuya worked for her uncle's company. The only thing Miyuki worries about is that they don't have children yet. Kazuya's dream was to become an architect, but he now works in the sales department for an architect firm run by his wife's cousin Yosuke. Kazuya then participates in a competition to design an art gallery. Kazuya wins the competition, but Yosuke placed his name on Kazuya's design. After Miyuki complains to Yosuke about his actions, Kazuya tells her something that has been on his mind. This causes tragedy. University student Satsuki (Erika Toda) joins a climbing club with her friend Kimiko. Satsuki falls in love with Koichi who is in the same club. When Satsuki views Kocihi as part of her fate, Kurata, from the climbing club, collapses from leukemia. Satsuki and Koichi take a test of their white blood cells. Satsuki finds out that she has the same white blood cell forms as Kocihi. A shocking hidden truth is reveled. 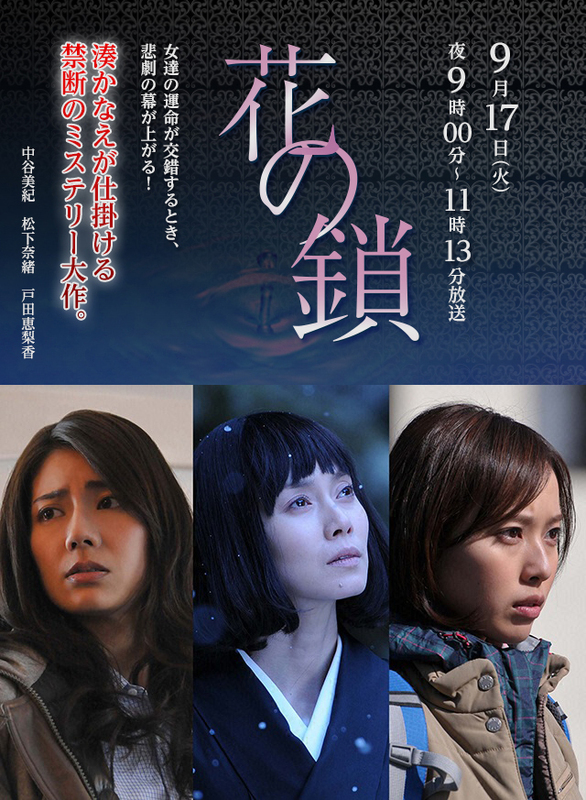 Based on novel "Hana no Kusari" by Kanae Minato (published March 8, 2011 by Bungeishunjū Ltd).